RVDB system, which is developed by NAOJ, consists of Data Input Output (DIO) (currently named OCTAVIA), 10 GbE switch, and Disk Data Buffer (DDB) (currently named OCTADDB). It is able to record the data with maximum 2048 Mbps, and can play back the observed data to the correlator with nominal 2048 Mbps. So, it has a function such as 2048 Mbps recorder and playback at the same time. As shown in Figure 1, the different types of playback systems are used in Daejeon Correlator. So, the purpose of the RVDB system is that it is able to adjust the data format and easily synchronize the data during playback and maintain the buffering between recorder speed and correlation speed. The main specification of VCS is described in Table 1. The VCS has a capability to process the total 120 cross-correlation and 16 auto-correlation intended for maximum 16 stations, maximum 8192 Mbps (4-streams x 1 Gsps/2-bit/64 MHz clock) input data rates per station. 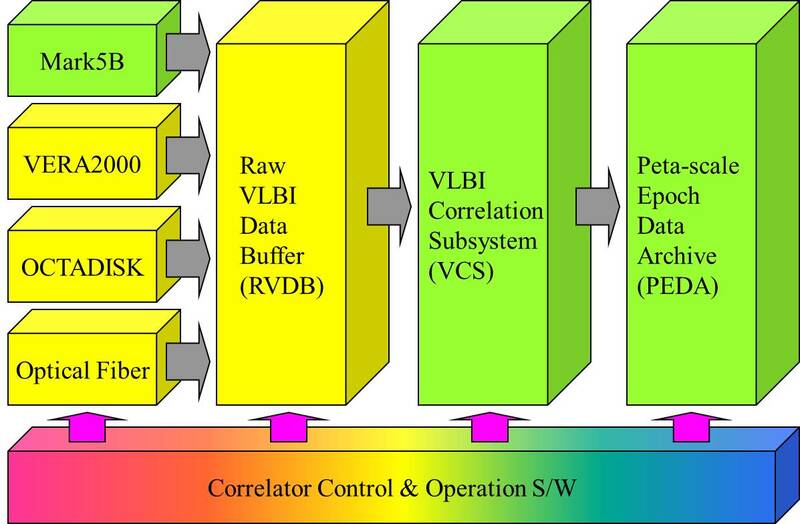 The design architecture for correlator is FX-based and it will use the variable length of FFT (Fast Fourier Transform) to maintain the 0.05 km/sec resolution of velocity at 22 GHz. 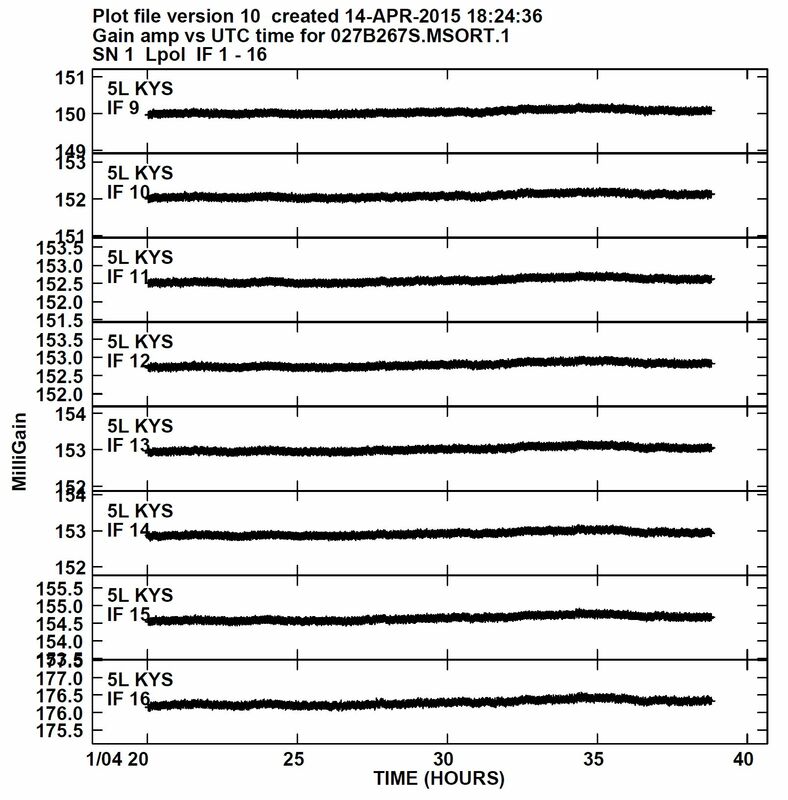 The maximum delay is ±36,000 km and maximum fringe tracking is 1.075 kHz. The number of frequency channel per correlation output is 8,192. The basic architecture is a CPU cluster connected with infiniband. For KaVA, the first phase data archive system with about 119TB capacity has been implemented. It has four 10 Gbit Ethernet input port to connect with VCS output and one 10 GbE Ethernet port is connected with data file system for sharing the disk with each other. We have a plan to increase the system capacity for support the EAVN in near future. CODA file system is used in data archive system for making the file system from correlated raw data, which is revised with ccCODA 2.0 library used in Mitaka FX correlator with some modification. New CODA files system based on the ccCODA 2.1 library was installed. Figure 2 shows the view of Daejeon Correlator installed at Korea-Japan Correlation Center (KJCC) located in KASI, Daejeon, Korea. 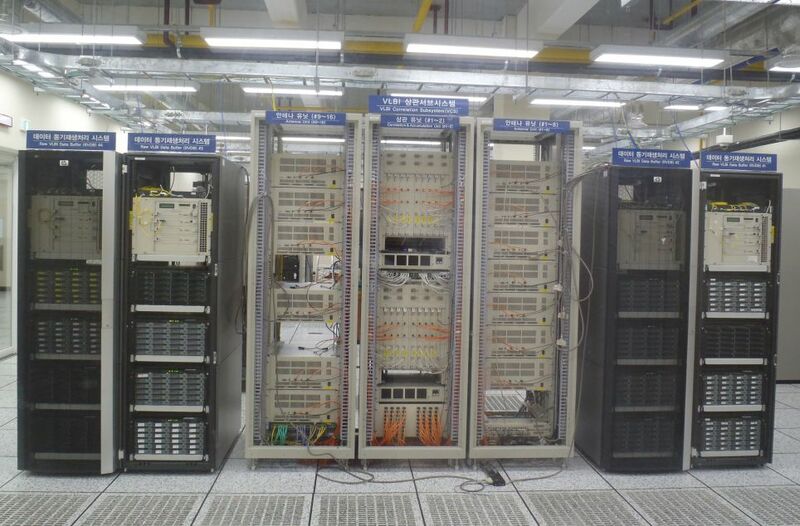 In order to verify the performance of Daejeon correlator, data analysis was conducted. 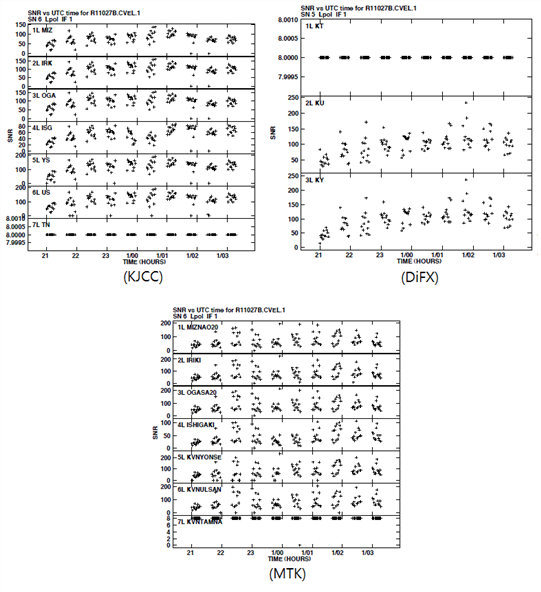 For the comparison Daejeon Correlator, Mitaka FX and DiFX correlator were used for data correlation. Observation experiments were listed in Table 3. We confirmed that results of Daejeon Correlator had consistent and correct value. Here we will summarize the results for R11027B and K11017A. 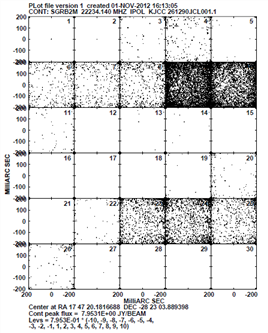 Figure 3 shows the spectrum shape after completion of FITLD, MSORT, USUBA and INDXR task based on FITS file generated by Daejeon Correlator and DiFX. Source is 3C454.3 for continuum with Yonsei and Ulsan baseline. Phase for all of 16 IF are continuously changed. The phase slope for DiFX is lower than Daejeon Correlator, but we think this is caused by adopting the clock-offset precisely while DiFX correlation. After fringe fitting, these values will be deleted and there is no serious problem in current phase slope. We looked into the variation of GAIN for each source for whole observation time after ACCOR. 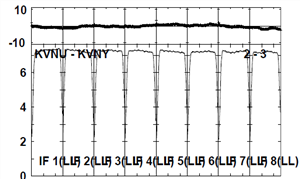 And then in figure 4, gain amplitude was continuously stable for source with long time integration. But in case of source with short integration time, the gain amplitude pattern for Daejeon Correlator was unstable for time range(between 22:00 and 03:00 for SgrA, Sgr2M) compared with DiFX. This phenomenon was appeared in only KVN station, this is caused with data synchronization while playing back. 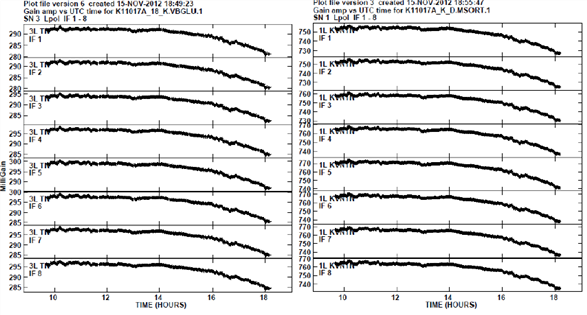 This phenomenon only occurred beginning of scan about 2~4sec, and the other time range is stable. We recommended the continuous recording of Mark5B while observation. By using previous fringe fitting result, Closure phase for 3C454.3 were obtained and showed in figure 6. We confirmed that closure phase was existed within about 5 degree by calculating with variation of phase for whole observation time and by integrating 50~64 channels value of 1st IF for both Daejeon Correlator and DiFX. Figure 7 shows the spectrum shape after fringe fitting. We draw again the spectrum in order to check phase residual by adopting the value of delay, rate after fringe fitting. For more detail comparison, the range of phase was enlarged to 10 degree and only 8 IFs were shown. Phase residual for spectrum of Daejeon Correlator and DiFX was almost same with 0 value. 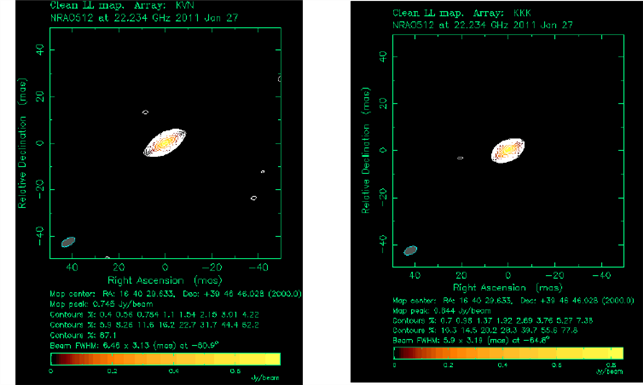 New result file was generated with averaging all IFs, all channels, and whole observation time for tables of 3C454.3 source by using SPLIT task. The 2-dimensional image map was generated using new result file and is shown in figure 8. 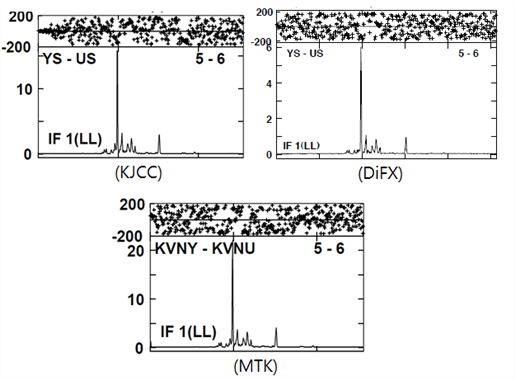 In figure 8, only KVN 3 stations were used for comparison to DiFX. Flux for Daejeon Correlator is 0.75 Jy/beam, which is less than about 12% compared with 0.84 Jy/beam of DiFX, but the dynamic range is almost same value. 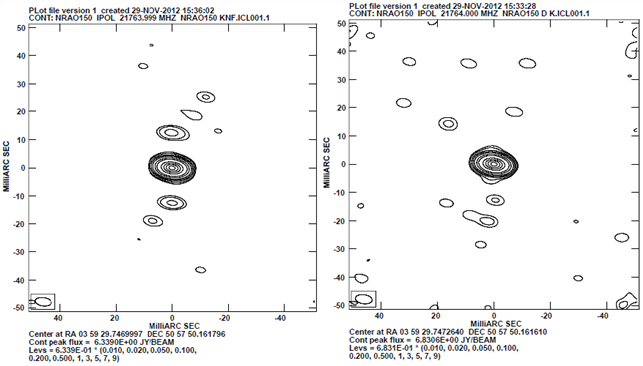 In addition, we plotted the visibility with 1-dimension at UV for confirmation as shown in figure 9. Figure 9 also shows the same result except the difference of flux both 0.75 Jy of Daejeon Correlator and 0.84 Jy of DiFX as plotted in above 2-dimensional map. 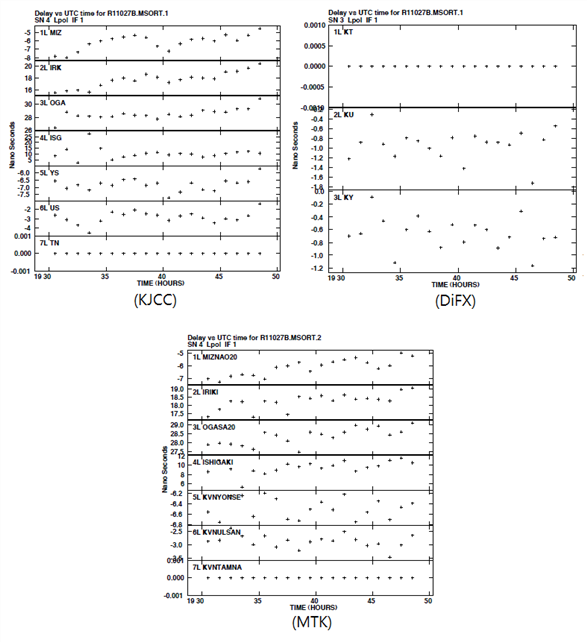 We looked into the Gain amplitude variation of each source for whole observation time after ACCOR as shown in figure 11. 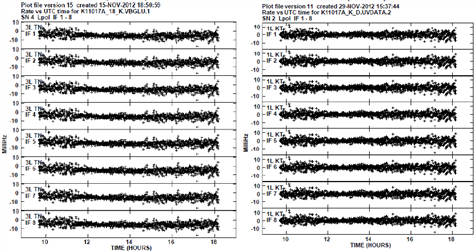 Daejeon Correlator and DiFX had same pattern. 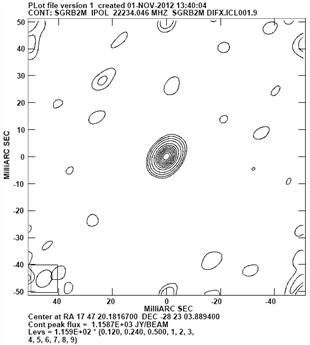 This observation was conducted for long time with NRAO150 source, so the loss of 2~4sec at beginning of scan was not affected in correlation result. By using previous fringe fitting result, Closure phase for NARO150 were obtained and showed in figure 13. We confirmed that closure phase was about 5 degree by calculating with variation of phase for whole observation time and by integrating 20~109 channels value of 1st IF for both Daejeon Correlator and DiFX. We draw again the spectrum in order to check phase residual by adopting the value of delay, rate after fringe fitting as shown in figure 14. For more detail comparison, the range of phase was enlarged to 10 degree and only 8 IFs were shown. Phase residual for spectrum of Daejeon Correlator and DiFX was almost same. 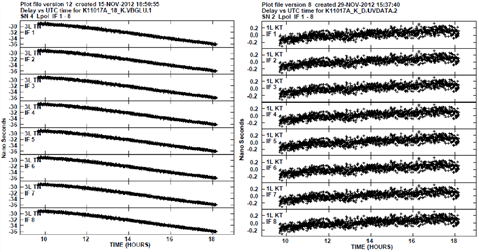 And in order to compare the flux, amplitude calibration was also applied. We confirmed that flux of Daejeon Correlator has about 10% lower flux than DiFX as described in R11027B experimental result. We confirmed the spectrum shape of POSSM task after completion through FITLD, MSORT, USUBA and INDXR tasks by separating only 9 IF of maser source in R11027B FITS file as shown in figure 17. The used maser source is SgrB2M, which shows strong emission line of H2O of 22 GHz. In case of 9th IF, we conducted the comparison work for 3 kinds of correlator such as Daejeon Correlator, MTK and DiFX. As you can see in figure 17, the entire spectrum shape look like almost same aspect, but Daejeon Correlator has phase concentration in 0 degree at the beginning of bandwidth because of DC-like component. These DC-like component and phase concentration are currently disappeared. 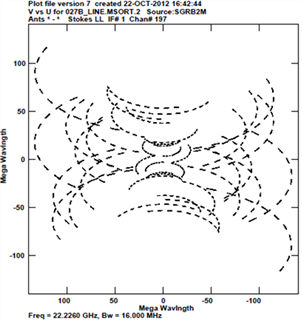 Spectral-line observation such as maser source is occurred the signal at very limited channel(within 10channels) per one maser spot. Therefore we should firstly apply the clock-offset compensation by performing the global fringe fitting according to the bright calibrator source because it is difficult to get the delay in narrow frequency range. In this case, 3C345 source was used for global fringe fitting and figure 18 shows the delay calculated by setting the reference as Tamna station. 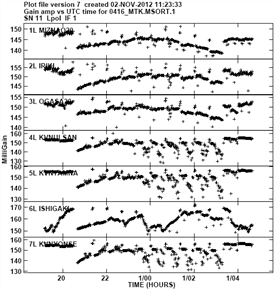 Daejeon Correlator and MTK had almost same pattern of delay, because same delay parameter was used for correlation. In case of DiFX, it has more small delay value, and we think that this was caused by applying the more detail clock-offset compensation during correlation of DiFX. In figure 18, the delay of correlation result looks good without any problem. Fringe fitting was again conducted for maser source by applying the delay value obtained after global fringe fitting. 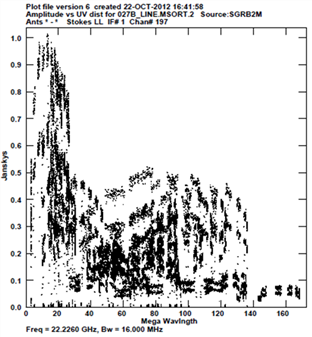 Although fringe fitting for continuum was done in accordance with entire channel, fringe fitting for spectral-line was done with only one channel which has peak value. In this figure, 197th channel has strong flux, so the fringe fitting was done with this channel. Figure 19 shows the variation of SNR of maser source for each station based on Tamna station. 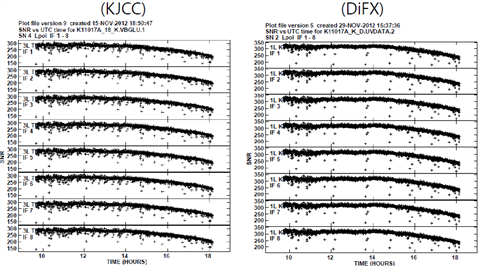 Daejeon Correlator, MTK, and DiFX had almost same SNR and variation pattern also look like same. It is very simple way to confirm the UV coverage in order to know how UV was filled with during observation of SgrB2M maser source. It is helpful to know the structure and distribution of flux of source as UV-distance. 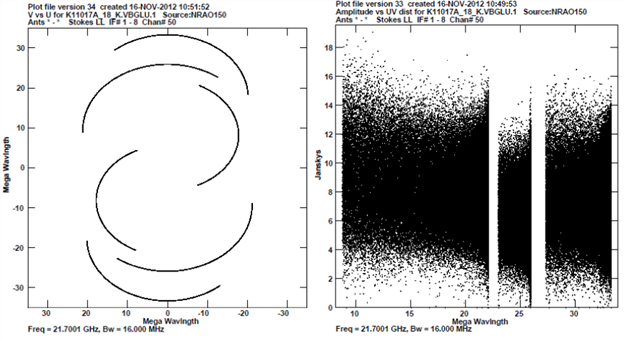 Figure 21 shows the UV coverage and UV plot of Daejeon Correlator correlation result. 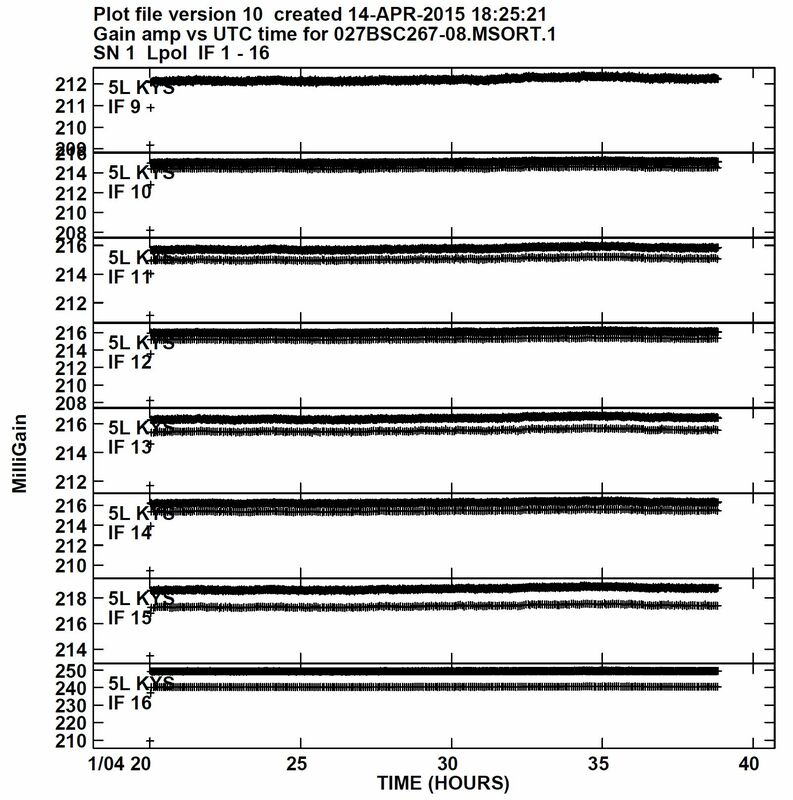 From pattern of UV plot, SgrB2M has the structure of Gaussian distribution at KVN+VERA 7 stations, and it looks like the bright spot with flat in KVN only baseline(less than about 30Mlambda). We conducted the imaging work with special channel using maser source as well as continuum source. 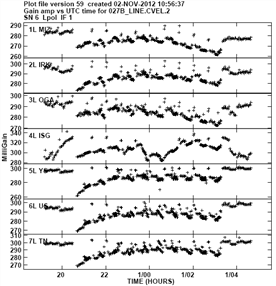 In case of data processing stage for spectral-line, BPASS and CVEL task were additionally done. The result file was generated by applying result tables for SgrB2M using SPLIT task. 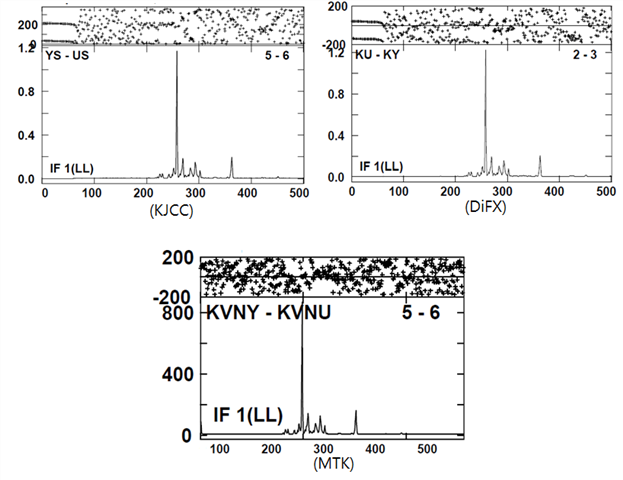 For comparison with DiFX, data for only KVN 3 stations was plotted in the same way of continuum source as shown in figure 22. Flux density for Daejeon Correlator is about 10% lower than DiFX, but dynamic range is almost same. In case of maser source, maser spots are existed with several tens and thousands in the uniform range. In general, imaging of maser source is performed as follows. 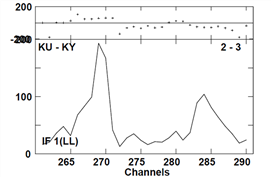 Firstly we found each peak channel as refer to spectrum, and then the position of whole maser spots as indicated. Finally 2-dimensional distribution map is plotted. In this experiment, in order to reproduce image, the position was obtained by imaging for several maser spot, and then we confirmed whether the position of maser spot for DiFX result was consistent or not. We conducted the multi-channel imaging work as shown in figure 23 so as to find the maser position, and confirmed that the maser spot for 264th, 269th, 274th, 280th, and 284th channel was detected. Daejeon Correlator had solved the recent issue, named the two-layer problem. This was caused by fault on the address set to data memory reading pointer in data serialize FPGA part. 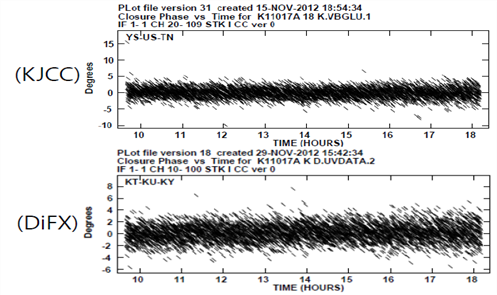 Resultant data mixtures across the sub-bands was found out as two-layer pattern on a time-power plot, as like as the left panel of Figure 24. 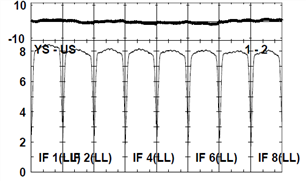 The influence of two-layer problem is dependent on the power difference to the first sub-band(IF1), and the loss of visibility amplitude is estimated as less than ~3% for luckyless case.